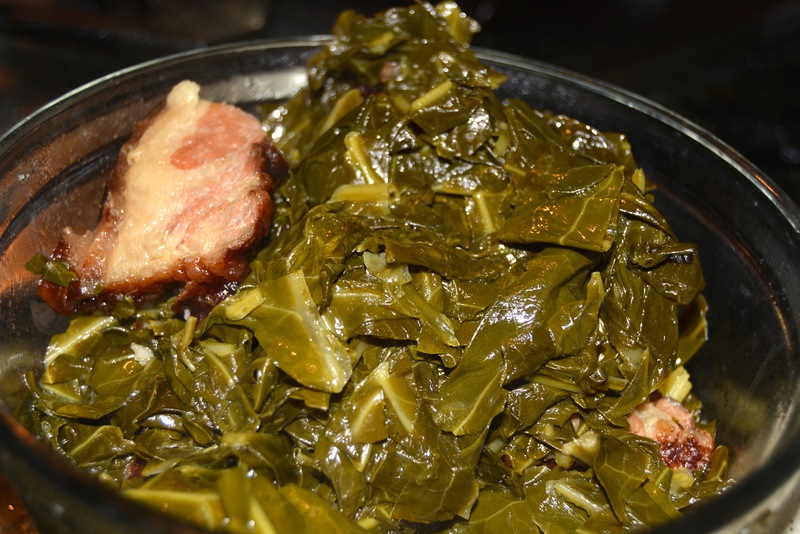 Collard Greens are so distinctly southern and possibly my favorite cooked green dish. Remarkably easy to make and yet robust, flavorful and unique. Accompanying a slow cooked pot roast, grilled pork chops, or meatloaf, collard greens are my perfect choice of vegetable side. 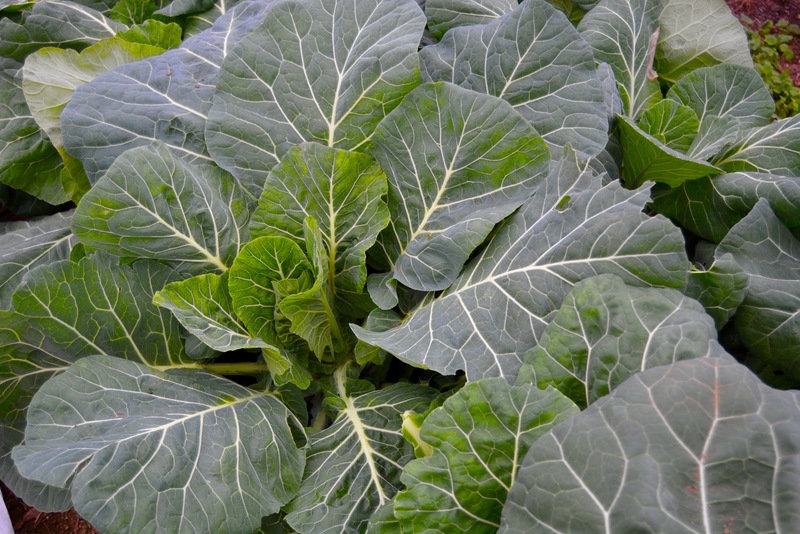 Collards are a tough, hearty winter growing vegetable. Surviving many freezing nights and frost covered mornings, collards are one of the few crops we harvest in December and January. We plant our late fall/winter crop of collards in September and harvest from early November to the end of January. 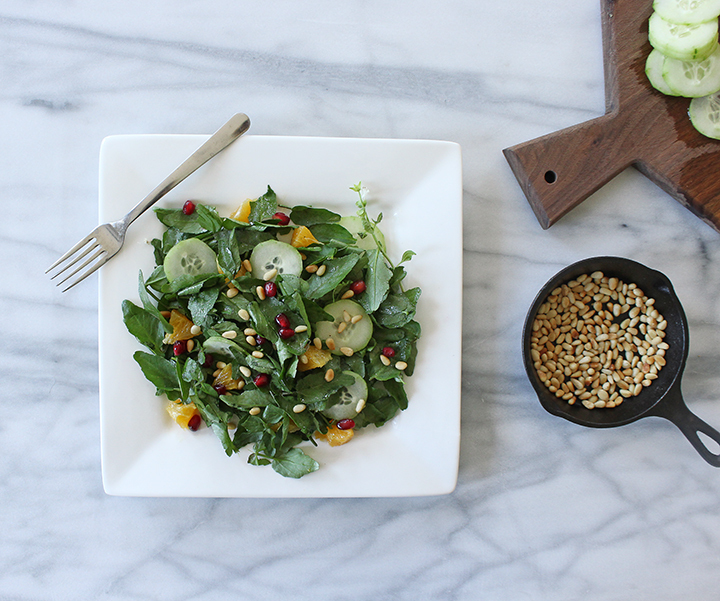 For our recipe, start with freshly harvested greens picked up at your local farmers market or out of your CSA box. De-stem the greens. 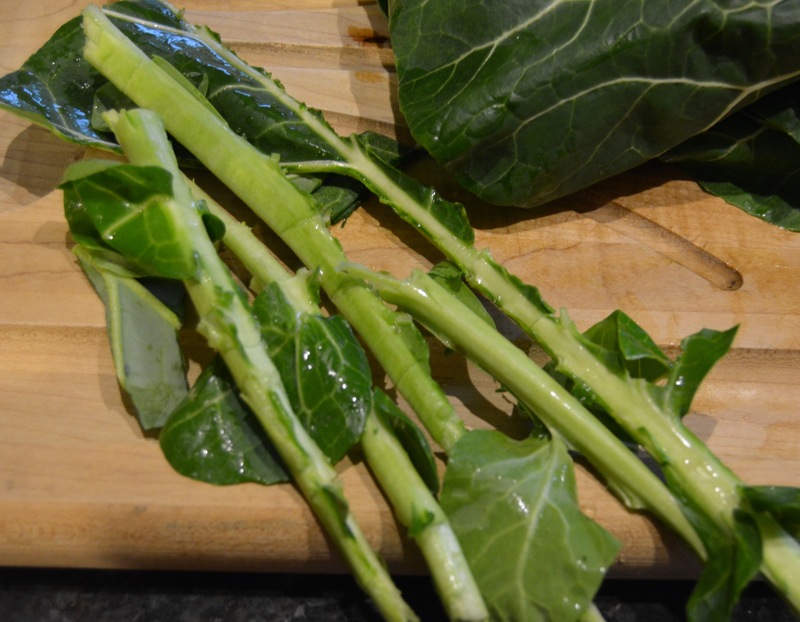 Collards have a very tough, thick center stem. An easy way to prepare is to strip the leaves off by holding upside down and running two fingers along this center, ripping as you go. 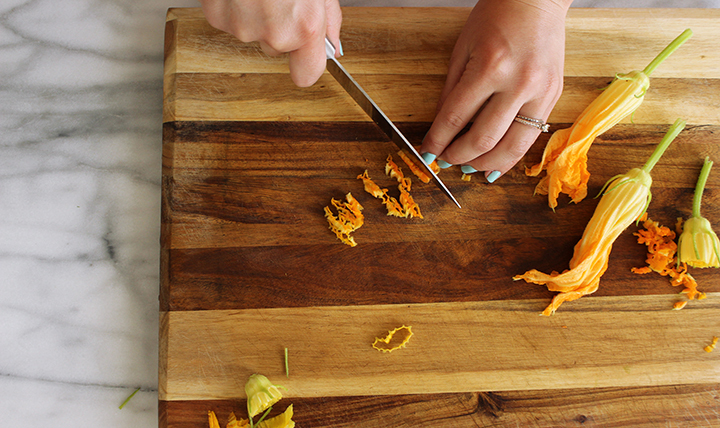 Layer the stripped leaves on a cutting board and chop into 1″ pieces. smoking meat. my favorite is the smoked jowl but equally good is a thick smoked bacon or smoked belly meat, if you can find it. Heat the oil in the stock pot and sauté the onions until translucent and soft. 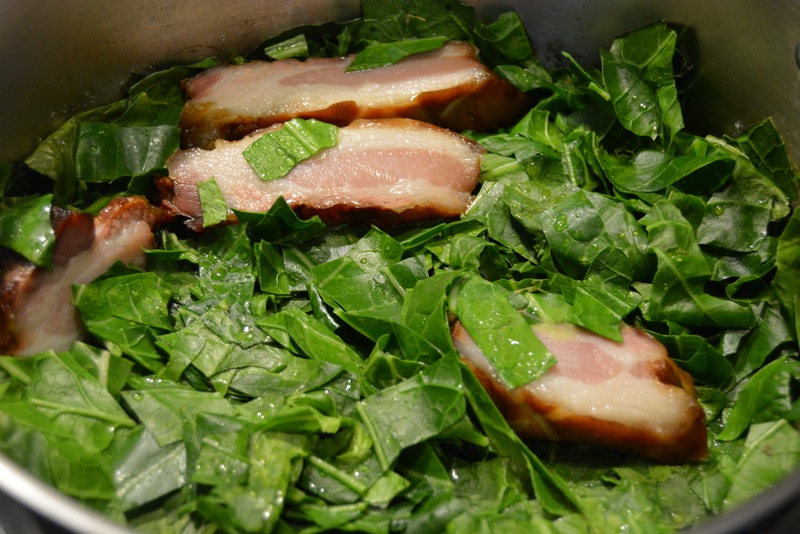 Add the collards, broth, smoking meat. Cook on low heat 45 minutes to 1 hour, stirring occasionally. 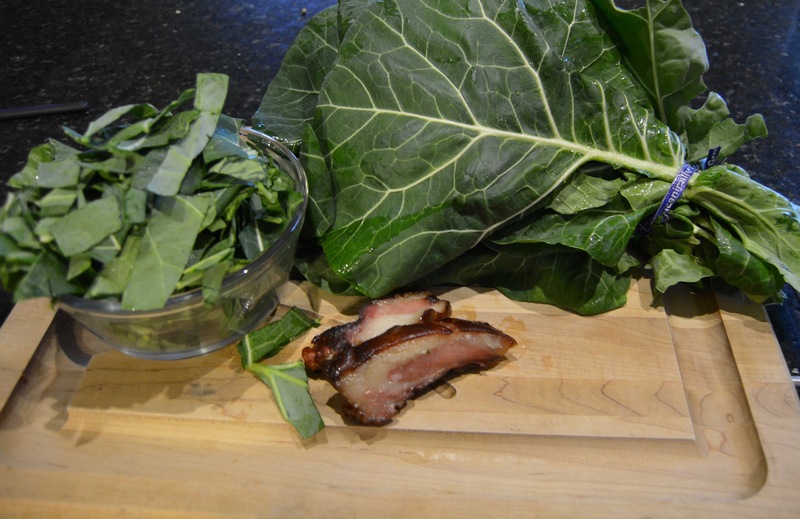 Collards will turn a darker green and become tender. The smoked flavor of the meat along with its juices will coat all the greens in a smokey, rich goodness. This entry was posted in fall crop, Recipes and tagged collards, delvin farm recipe, greens, winter vegetable on January 10, 2016 . 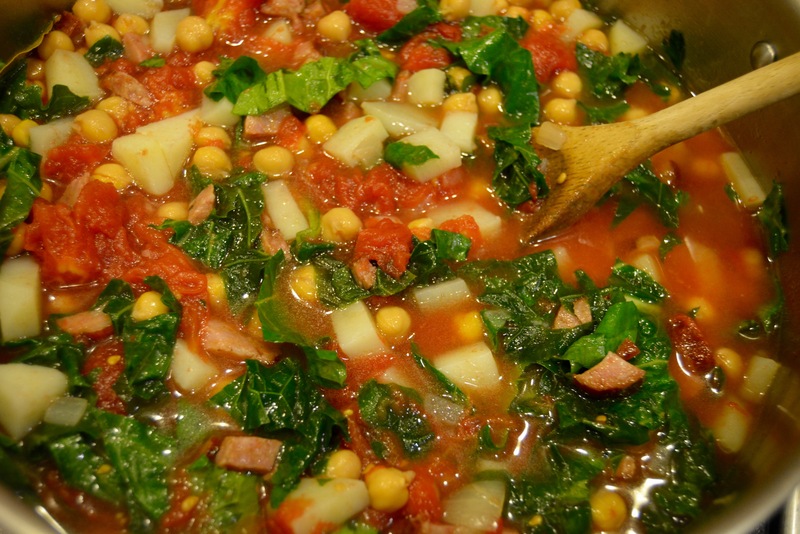 I had my first taste of Portuguese Kale soup years ago when I was working in Fall River, Massachusetts. Fall River is blue collar town with a history rich in fishing, shipping, manufacturing and sailing. 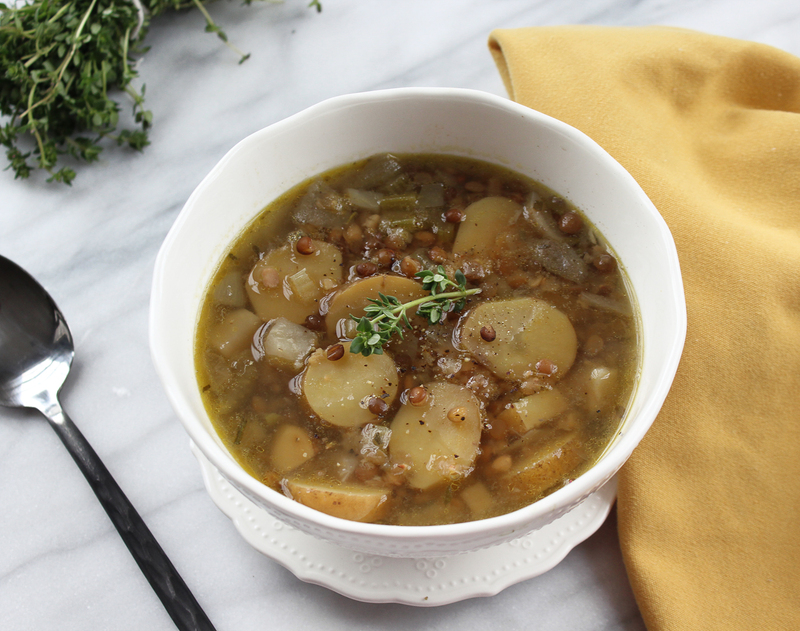 With a large Portuguese immigration population, this kale-chourico soup is on the menu of a lot of the local restaurants. 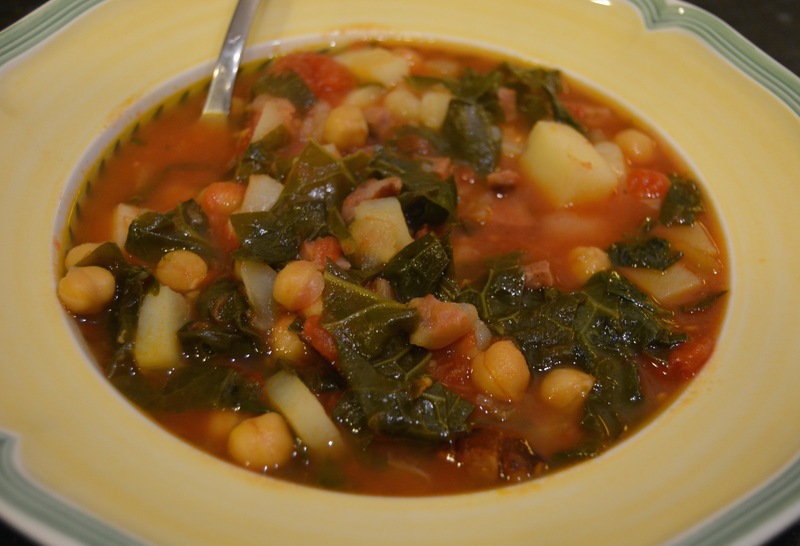 A hearty, warm soup for the colder months; it has become my “go to” soup recipe for kale. My favorite kale to use is the wintered Siberian Kale harvested straight from our fields in the winter months. After the first frosts of the fall season, the siberian kale takes on a sweeter more mellow flavor. On the farm, we can harvest the Siberian most of the winter as it is a hearty plant that survives the coldest of weather. Part cover crop, part cash crop, we plant the siberian with a mixture of clovers for winter protection. In the spring, the kale and nitrogen capturing clover help feed our soil with rich organic matter that is turned right under. 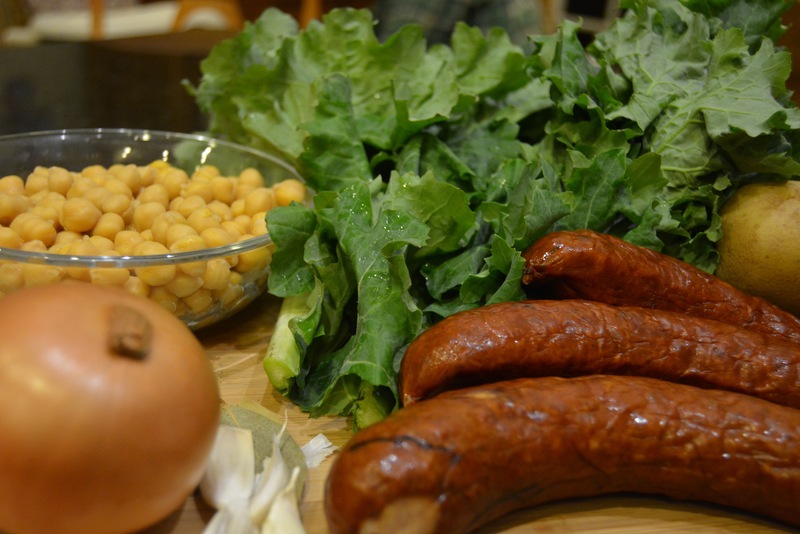 I think the key to this recipe is finding a good Chourico (Chorizo) sausage. I’ve tried a lot from the supermarkets but they all seem to have an artificial flavor or try to mask poor taste with a spicy heat. Recently, I found what I believe is the best chorizo I’ve ever tasted from a local butcher shop here in Franklin, TN, The Carnivore Market. Located just off 5 points in Franklin, their sausage is a perfection of spice and smokey flavors that immediately melds with all the ingredients of the soup making a perfect bowl. Their chorizo is so good, we have made this soup twice in the last week. Canned tomatoes from our summer harvest is perfect for this soup. Heat the oil in shallow pan over medium heat. Add potatoes, onions and cook 8-10 minutes til potatoes are softened. Add garlic and kale. Cover and cook til kale is wilted. Transfer contents to medium sauce or soup pot. Add beans, tomatoes, chourico and broth to the pot and bring up heat to slow simmer. Cook for additional 15-20 minutes to really blend flavors together and bring out the chorizo. This entry was posted in CSA, Recipes, Uncategorized and tagged recipe, Siberian Kale, soup, tomatoes on December 11, 2015 . November can’t be official until a hearty soup is simmering in a crock pot all day long on a Sunday. 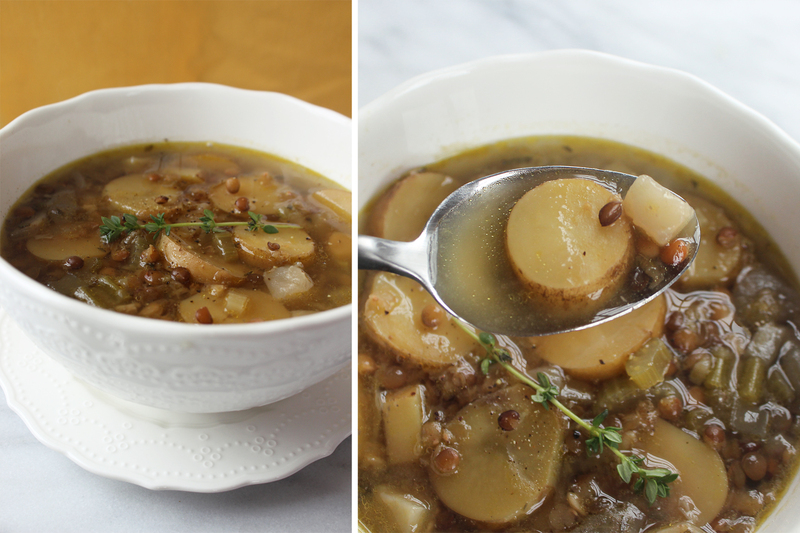 Inspired by quirky fingerling potatoes from Delvin Farms & a multi-lentil “autumn” blend from Whole Foods, I quickly threw together the ingredients and have been enjoying the rest of my day not in the kitchen. 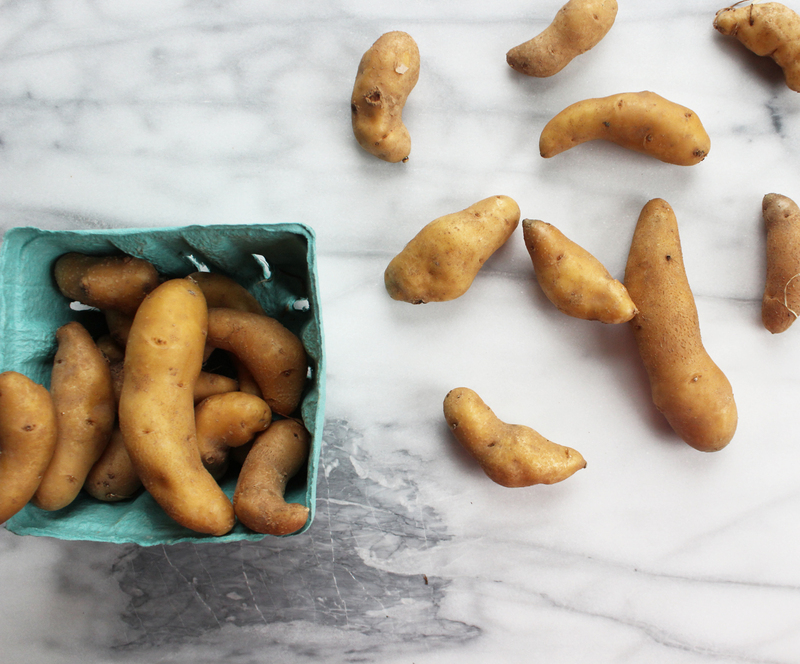 Fingerling potatoes are a great source of vitamins, minerals, and dietary fiber. I left the skin on for taste, texture, and Vitamin-C (a much needed vitamin in gloomy-autumn). Delvin Farms grows organically, so when tossing all of these raw ingredients into my crock pot, I can rest assured I’m not simmering anything but true goodness! 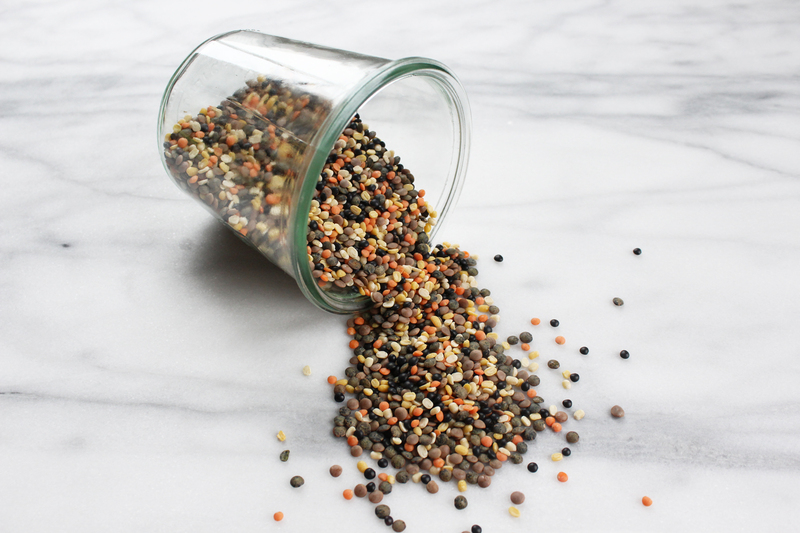 + 1 cup autumn blend lentils (or a variety of lentils: French Green, Petite Crimson, Golden, Black Beluga, Spaish Pardina, and Ivory White). Salute the diced onion and minced garlic in a small skillet with olive oil. Place in a crock pot, turned on “High” and add ALL additional ingredients, diced/chopped/cubed! Go enjoy your day and come back to eat in 5-6 hours! — Amanda Barnhart is an art director, food enthusiast, and cat lover. She curates & photographs new recipes weekly on her vegetarian food blog, PlatedColor.com. You can see more photos and read about this recipe there. 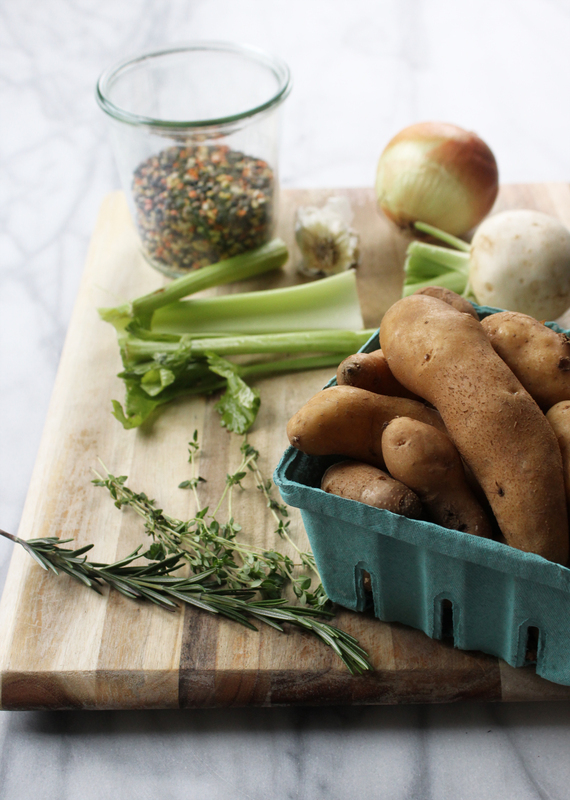 This entry was posted in CSA, fall crop, Recipes and tagged csa, easy meal, fingerling potato, recipe, soup on November 2, 2015 . Corn, peppers and tomatoes are overflowing at Delvin Farms. 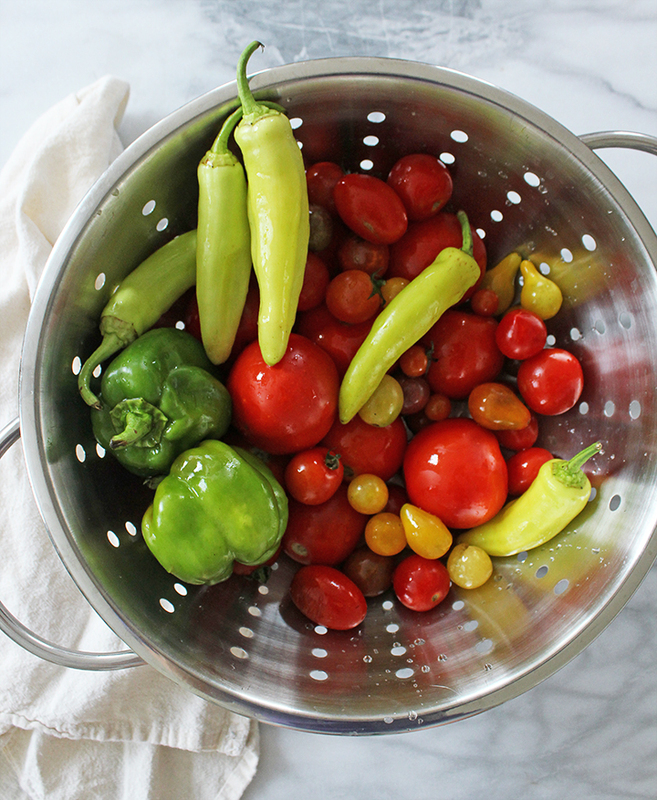 I picked up these colorful ingredients, hoping to hang onto the taste of summer and spend another evening outside. Many people are back to the swing of the school year and new “fall” schedules, but I’m refusing to let summer go. This dip requires little prep time in the kitchen so more time can be spent soaking in the last of August. As summer would have it, I prepped this Corn, Pepper & Black Bean Dip amidst an afternoon thunderstorm. Hoping the clouds would clear away before guests arrived for an outside party just as quickly as the mess in my kitchen will disappear too. 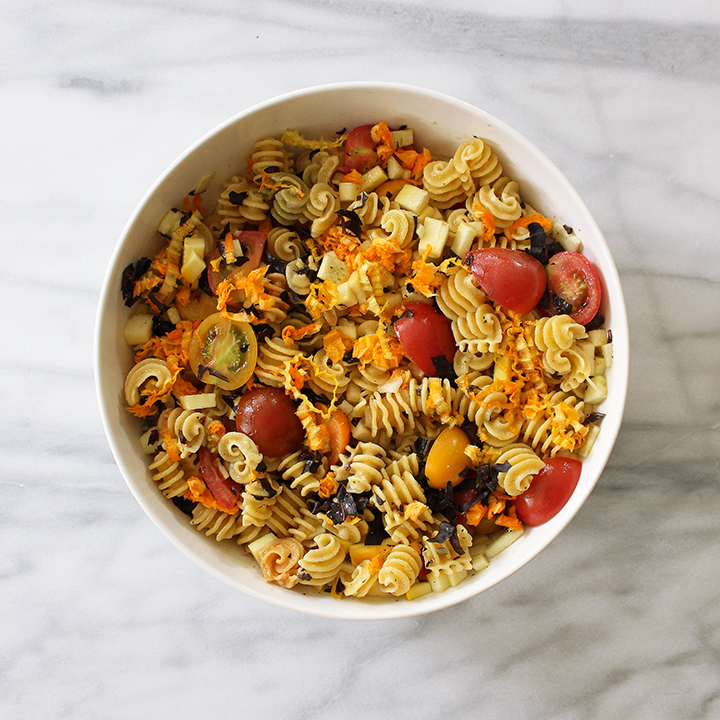 Toss all ingredients together into a large bowl. Pour over the olive oil and balsamic vinegar. Season with all purpose spice, salt & pepper. Fold together gently. Let chill in the fridge for a few hours to let all of the flavors blend together before serving with hearty, tortilla or pita chips. This dip is very easy to make and would make an excellent side for grilling out or taco night. 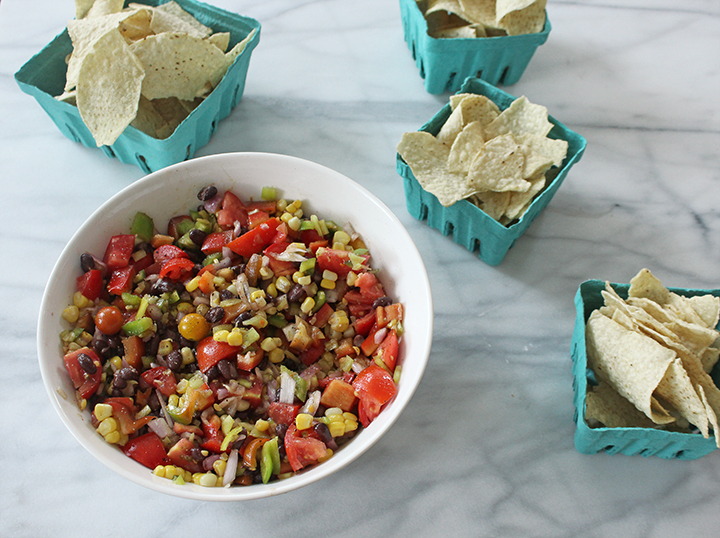 This entry was posted in CSA, Recipes, Summer Crop and tagged bean dip, corn, delvin farm recipe, jalapeños, organic, plated color, salsa, tomatoes on August 18, 2015 . Sweet, juicy, Athena cantaloupes are being harvested now at Delvin Farms and are perfect for a summertime mint, lime and cantaloupe chiller. Grown organically and enjoyable anytime of the day in summer, I wanted to try a different way to consume this delicious melon. Despite not having a great blender, I’ve been determined to make a fun chiller this summer. 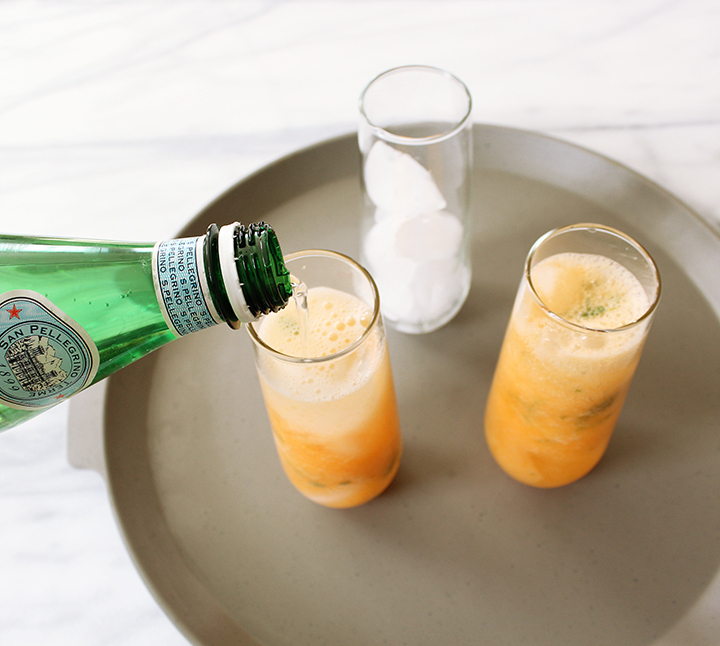 This was so quick to make and made a Saturday afternoon a lot more fun & refreshing. In the dog days of summer, this chiller is a treat! 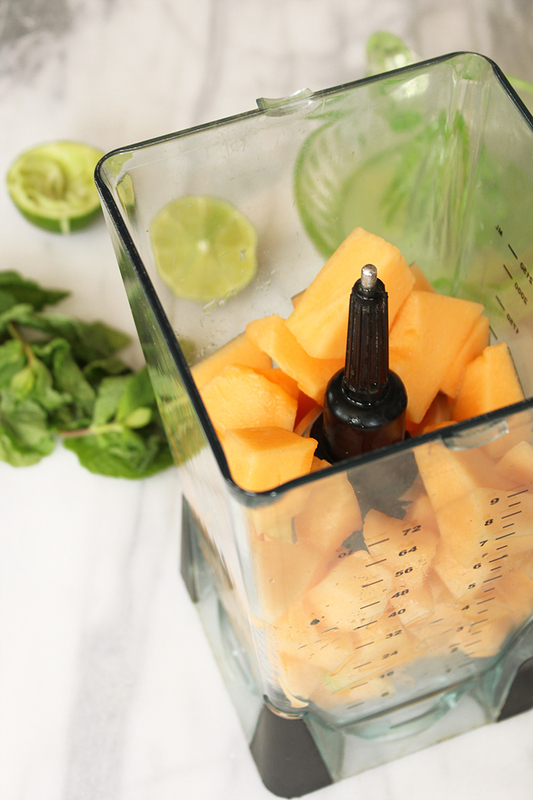 Cantaloupe is naturally hydrating and helps with inflammation and digestion. Don’t you love knowing the benefits to simple fruits & vegetables? 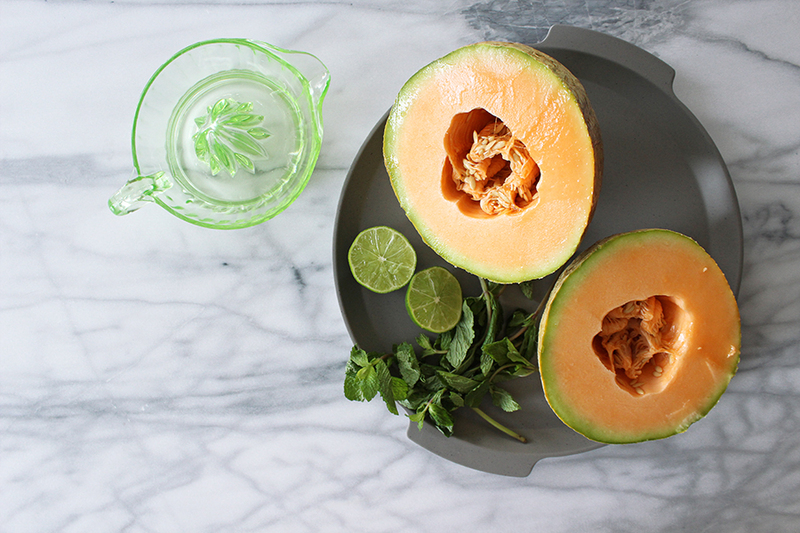 Dice cantaloupe and blend with lime juice and honey. Add in mint leaves at the end and pulse quickly. Pour mixture over ice, about 2/3 full in your glass. 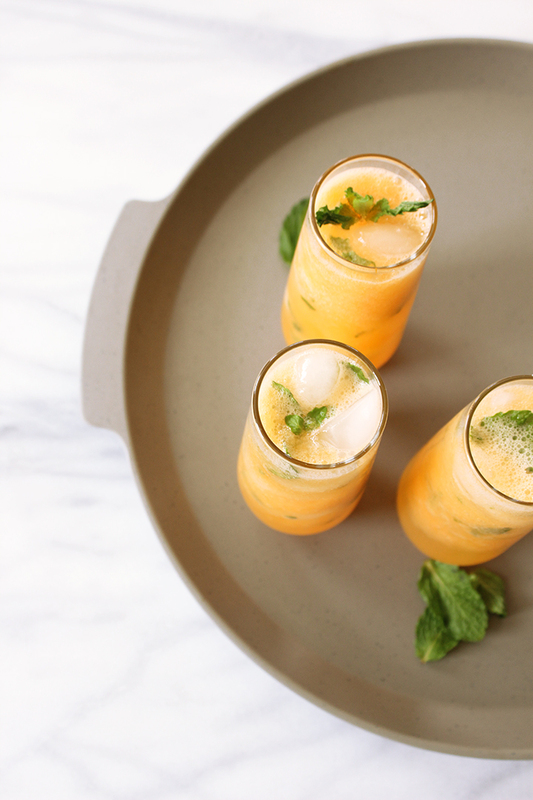 Top with sparkling mineral water and garnish with more mint, to your liking. 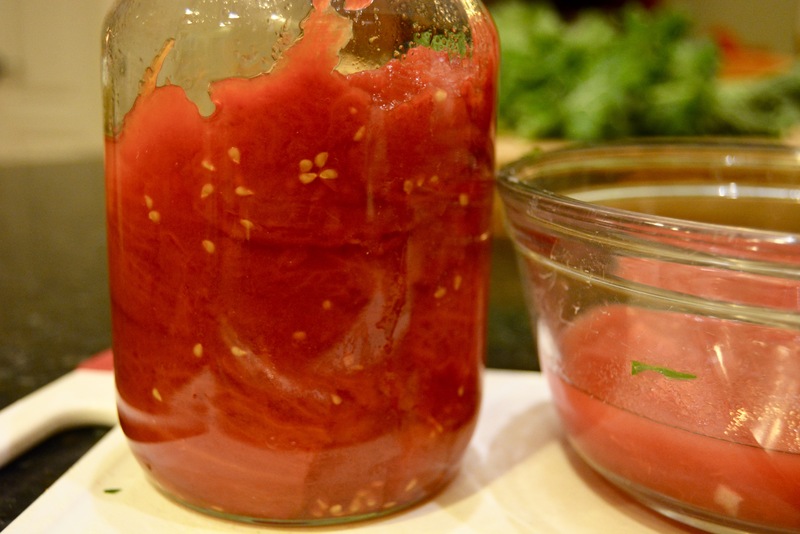 This entry was posted in Recipes and tagged cantaloupe, delvin farms, mint, organic vegetable, plated color, recipe, refreshing on July 26, 2015 . Summer means more time spent outside and less time in the kitchen. Quick, easy snacks or light breakfast meals are a must with schedules packing calendars and sunny skies begging to be enjoyed with family and friends. 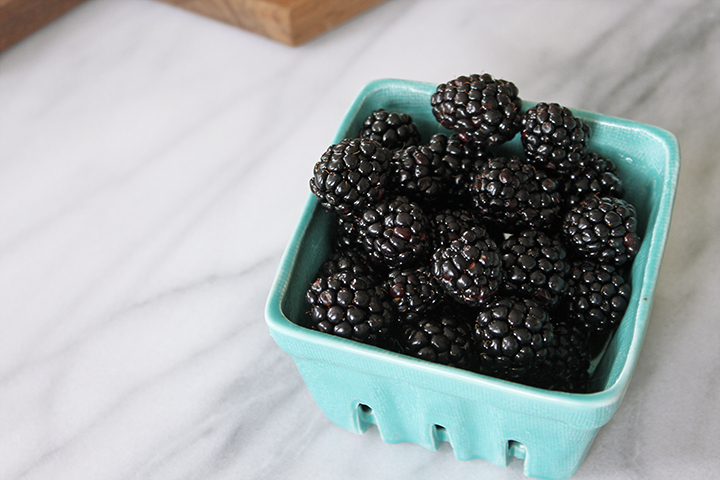 Delvin Farm’s blackberries hit the market a few weeks ago and pairing it with mascarpone seemed like a sweet treat for a lazy Sunday morning. 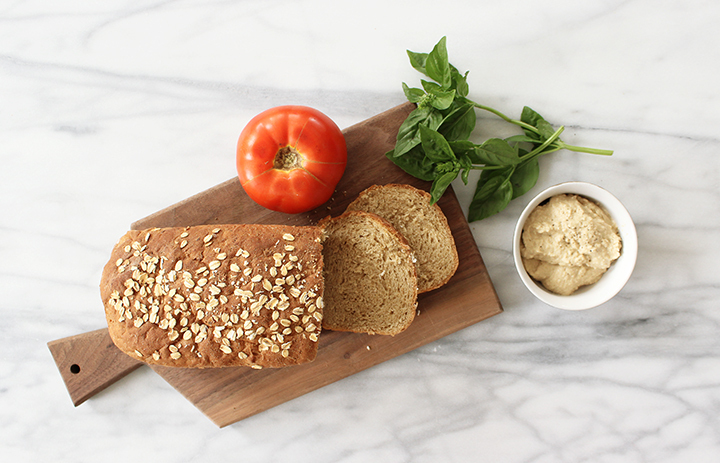 I also snatched up the bightest red tomato and basil bundle for another toast recipe I had a craving for with hummus as a base. 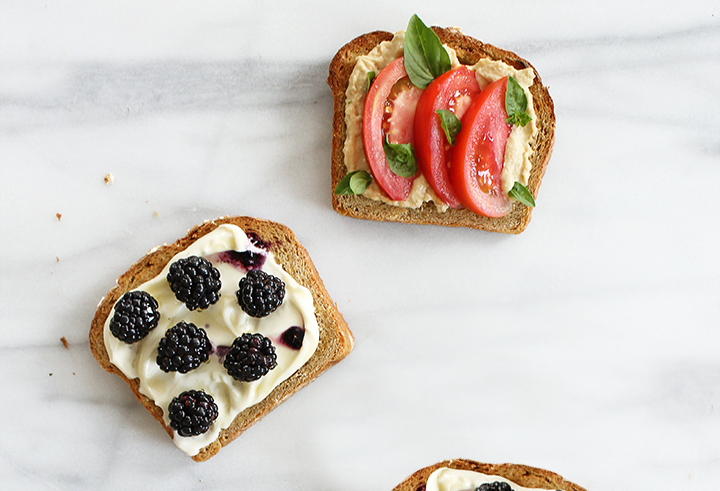 Toast doesn’t have to be boring and it can serve as a substantial snack, sweet or savory! 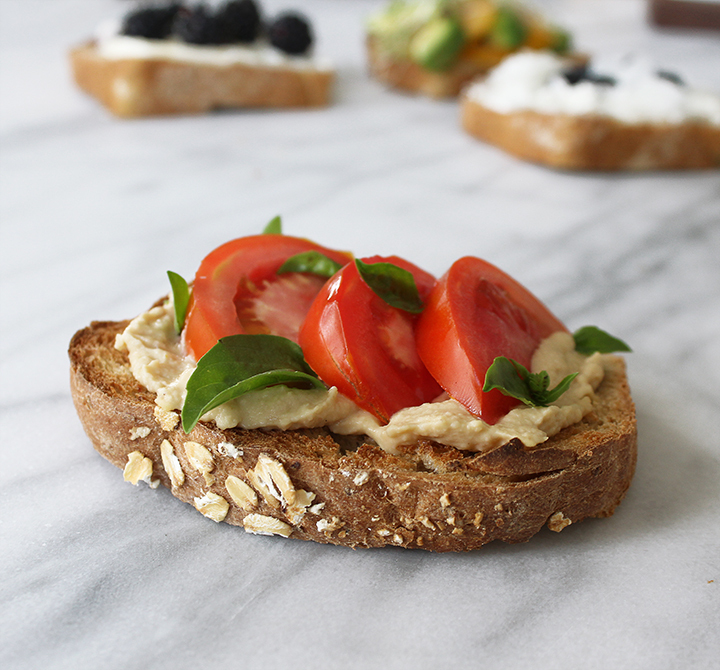 + Toast whole wheat oatmeal bread, let cool slightly before spreading mascarpone (a lighter, Italian cream cheese). 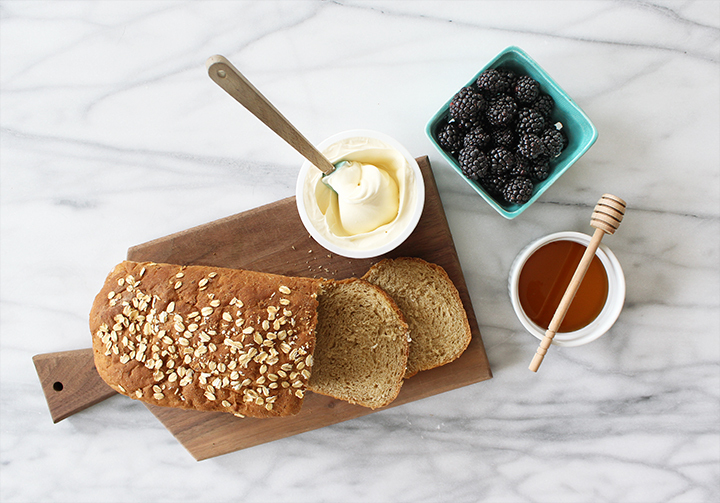 Top with whole blackberries and drizzle with local honey. 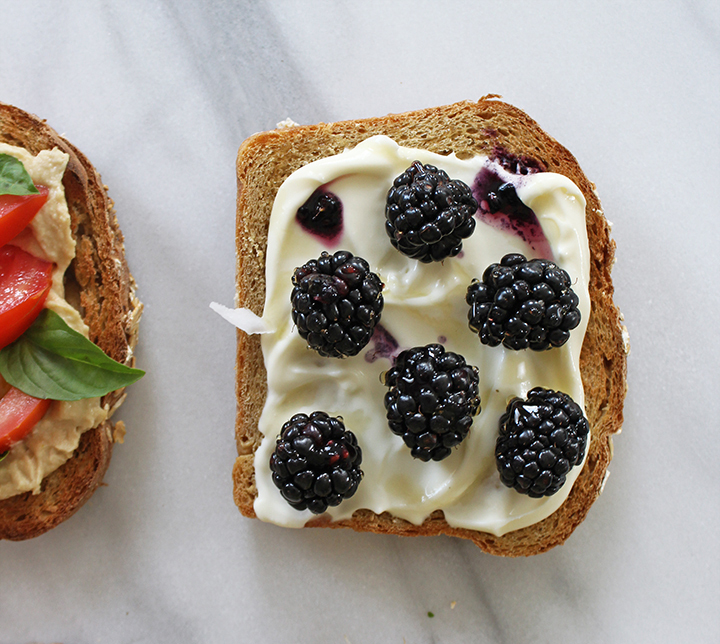 + Toast bread, spread with hummus. Halve tomato and slice into thin wedges. 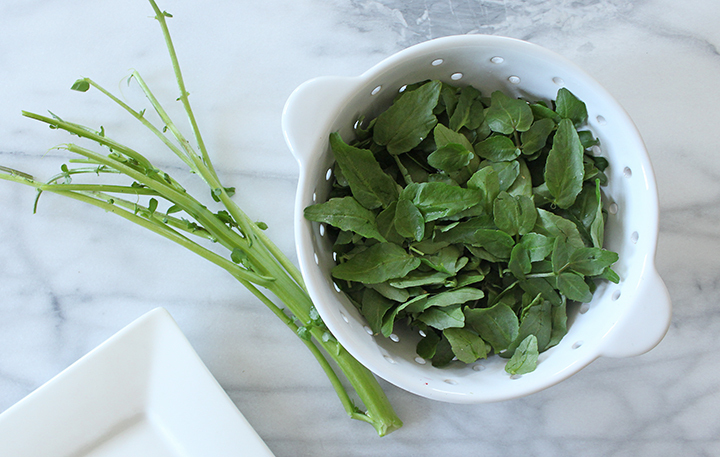 Arrange on toast and sprinkle in small, fresh basil leaves. This entry was posted in CSA, Recipes and tagged blackberries, fruit, organic, recipe, summer produce on July 7, 2015 . 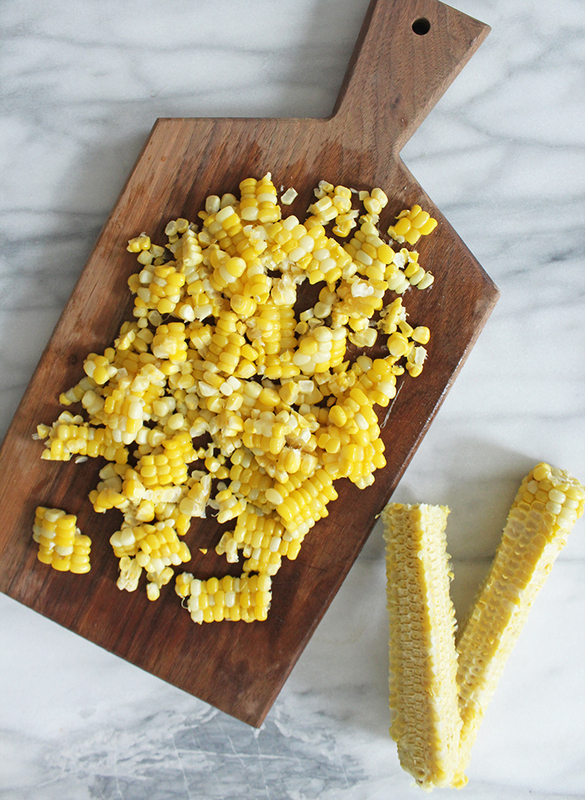 ‘Bring a side dish’ means it’s officially summer. 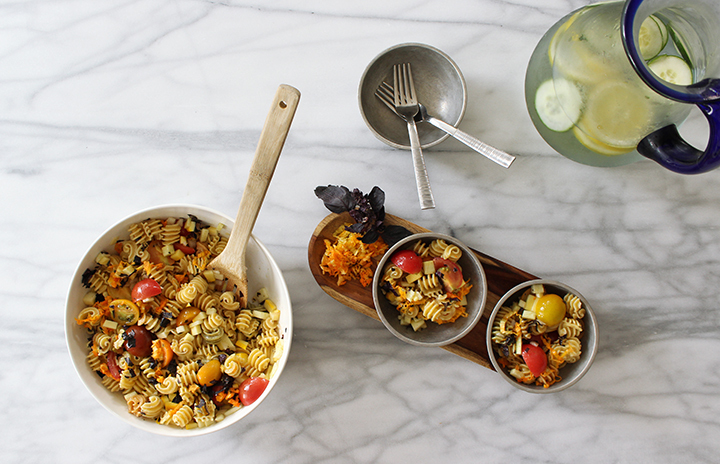 I think we can all step up our game in pasta salad and add a new staple to our summer plates. Starting with local ingredients in season helps add flavor and color, plus using a vegetable pasta made from quinoa grain keeps it healthy and packed with protein. 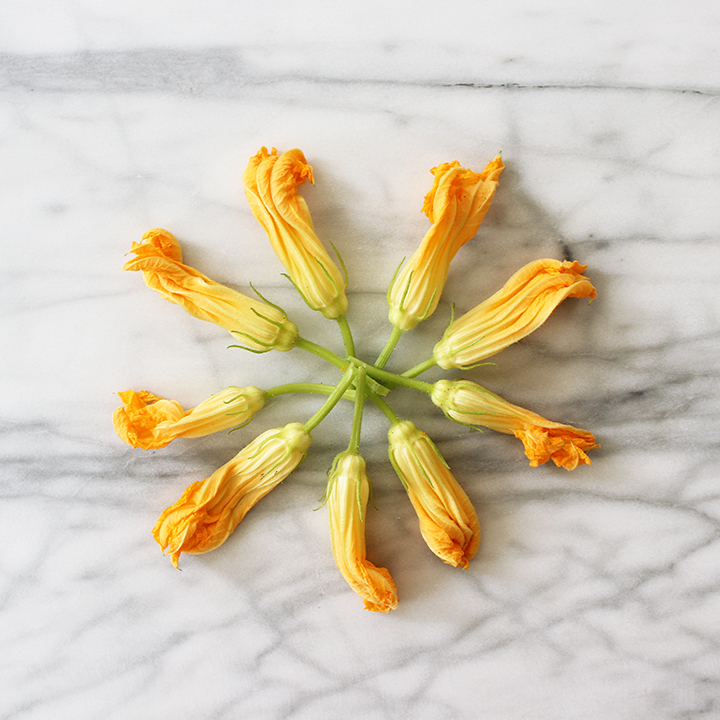 When I saw the seasons first pint of heirloom tomatoes from Delvin Farms and squash blossoms, I knew the flavor was going to be out of this world. Making this recipe will turn heads at the next cookout you have to attend. 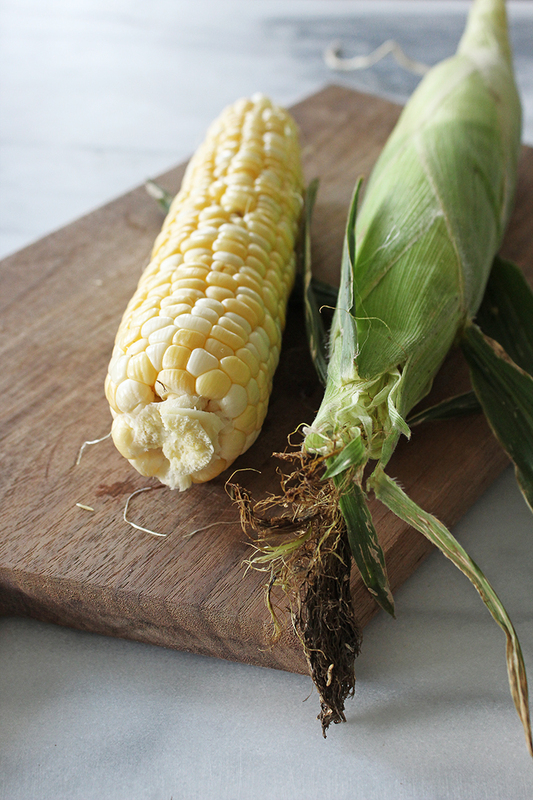 It would pair well with all of our summer favorites; veggie burgers, hot dogs, and corn on the cob. Cheers to summer time! 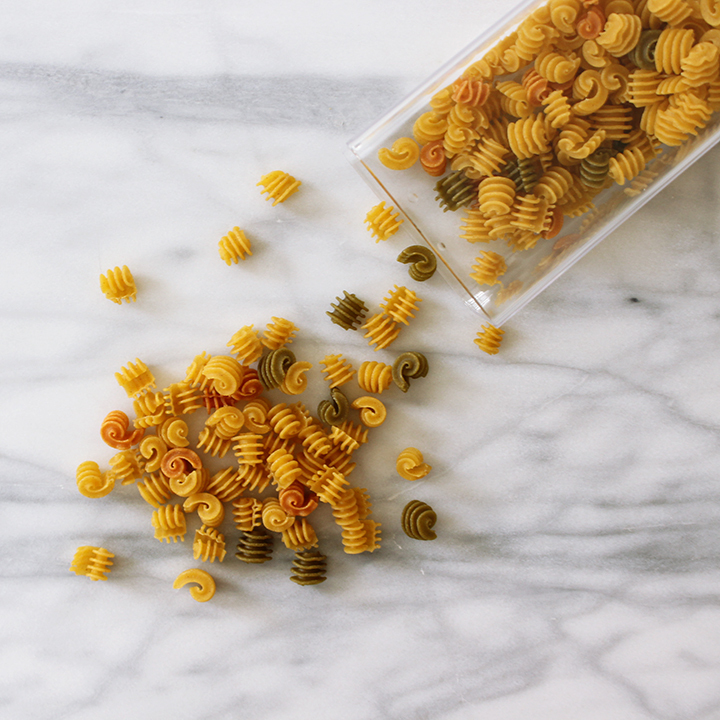 Cook pasta according to package, drain and set aside to cool in the fridge. 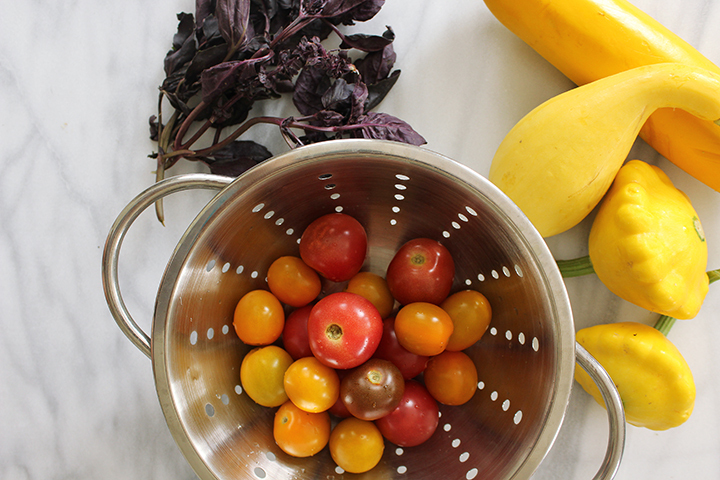 While the pasta is cooling, cut squash, quarter the heirloom tomatoes, dice the onion, and finely chop the purple basil. Set aside half of the basil. 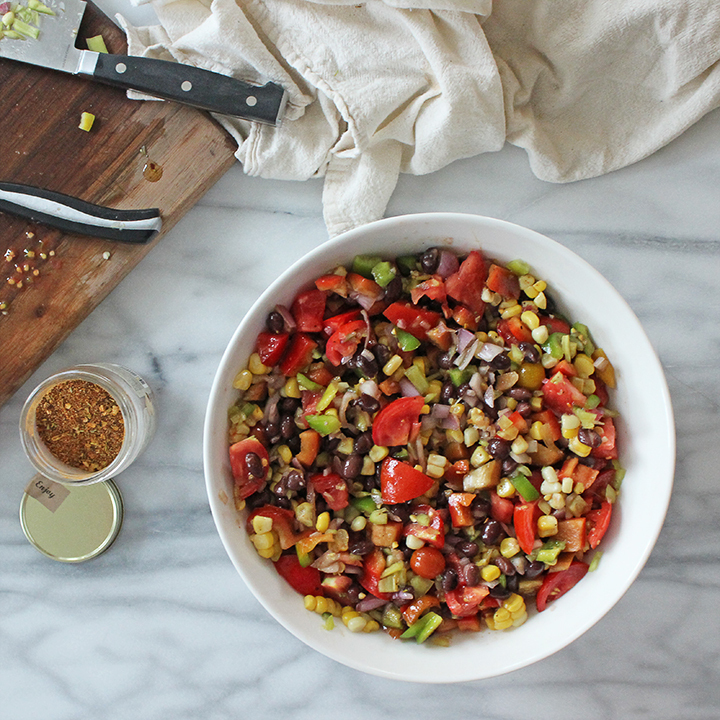 Toss all ingredients in a bowl and set aside. 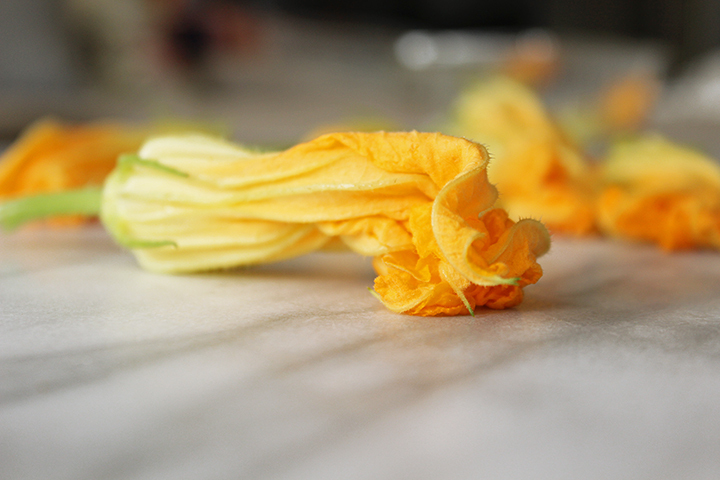 Slice the squash blossoms by removing the stem, and cutting it crosswise into thin strips. To make the dressing, combine 4 tablespoons olive oil with1 tablespoon red wine vinegar and whisk together with ample amounts of salt and pepper. Add the remaining half of the finely diced purple basil. Toss dressing & vegetables into the chilled pasta. 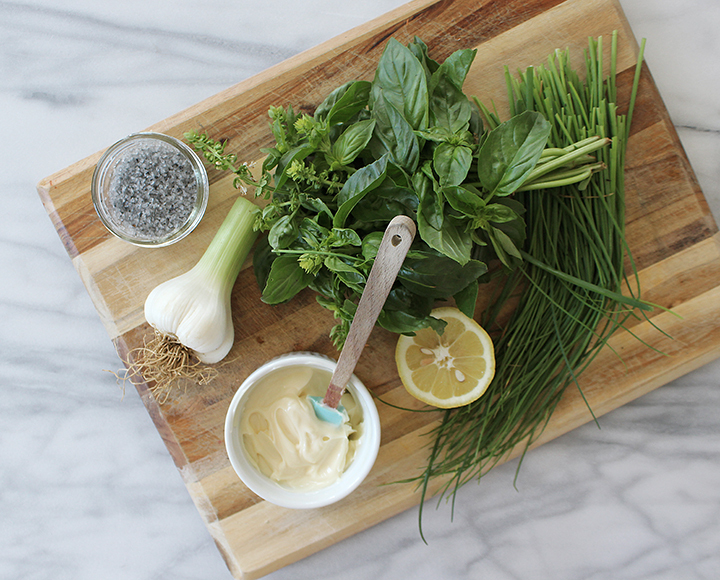 Garnish with more salt, pepper, and basil to your liking. This entry was posted in CSA, Recipes and tagged basil, cherry tomato, delvin farm recipe, pasta salad, plated color, side dish, squash blossoms, summer cooking on June 25, 2015 . Summer time is here. Last week it rained while it was also sunny, creating a heavenly smell with humidity touching every pore. 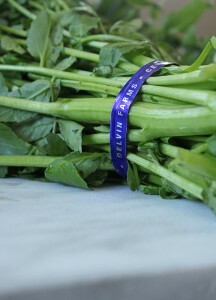 I love summer & the fresh produce it brings to the farmer’s market from Delvin Farms. Summer to me means fries and cookouts and veggie burgers and grilled eggplant. Potatoes are one of my favorite foods and in addition to roasting or baking them, I thought it would be fun to see if I could tackle the ole’ fashioned FRY in honor of summer! 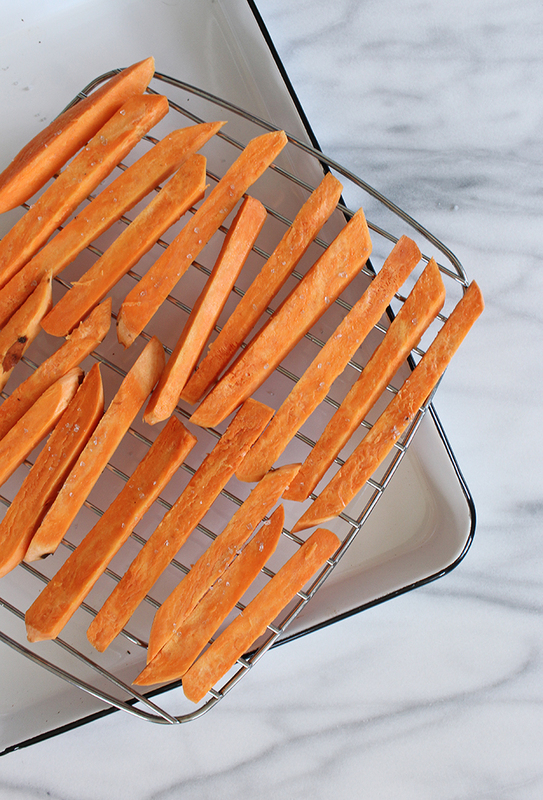 Sweet potato fries come to life in the sauce they are dipped in. 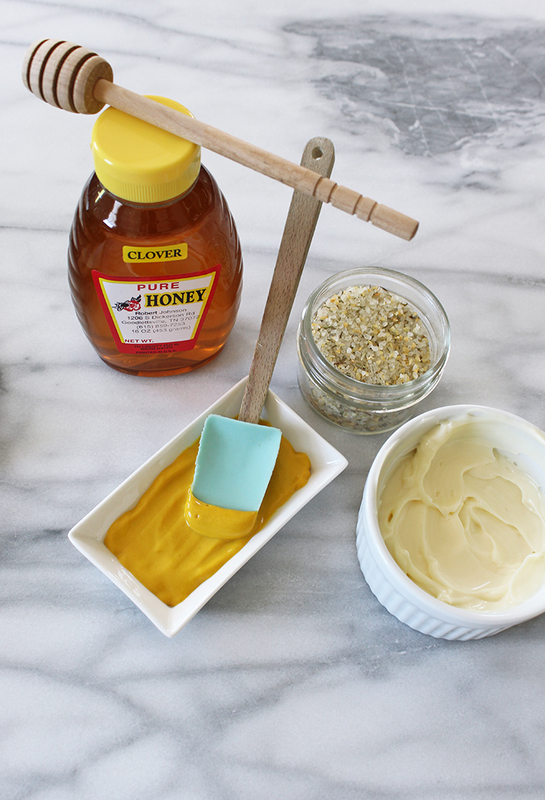 Because I couldn’t pick between a basic garlic aioli sauce or a honey mustard sauce, I decided to make both. The garlic aioli won my vote while the honey mustard won my husbands. 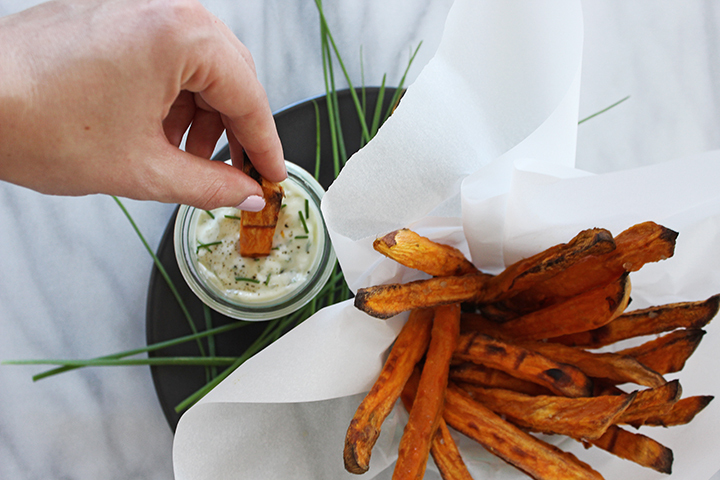 The next time you make sweet potato fries, serve with a variety of dipping sauces. Why not?! —Preheat the oven to 425. 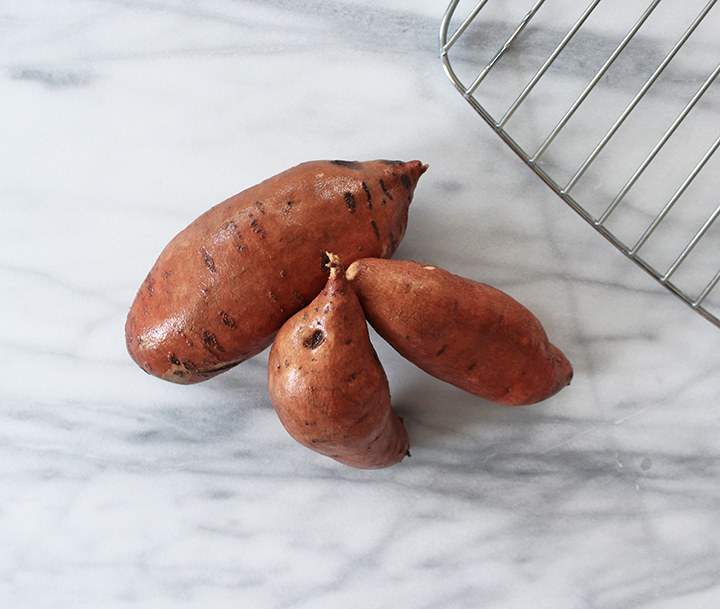 Peel and cut the potatoes into long rectangles or wedges. Coat in warmed coconut oil (coconut oil is a solid until it is warm). Season with black truffle sea salt and place directly on a baking rack. Bake for about 20-25 minutes, turning over the potatoes mid way through so they can get crispy on both sides. —Pound garlic cloves with salt and pepper until a smooth paste forms. 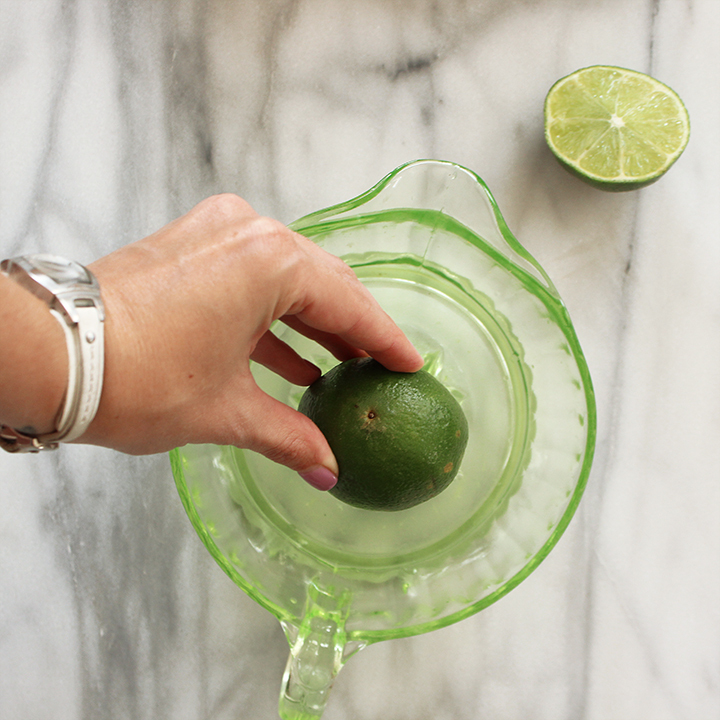 Stir it into the mayonnaise and add fresh squeezed lemon juice to taste. Garnish with fresh chives, salt and pepper. 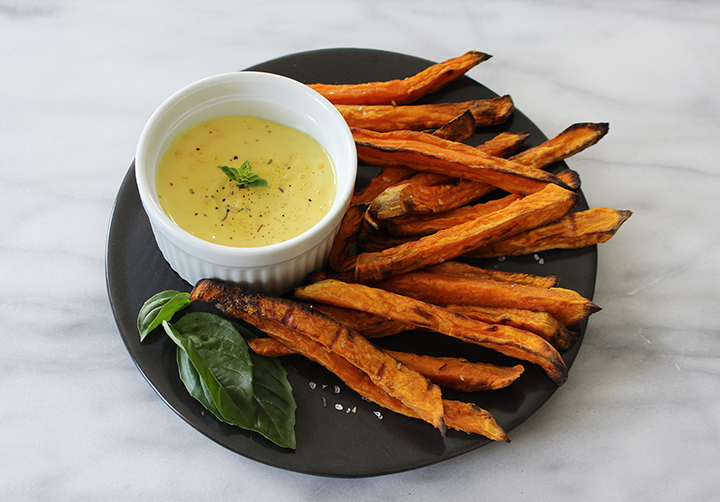 This entry was posted in Recipes and tagged basil, dipping sauce, fries, garlic, honey, mustard, organic vegetable, plated color, recipe, sweet potato, winter crop on June 12, 2015 . Strawberry season leaves us as quickly as it enters out of winters cold. Delvin Farms will have strawberries for one more week at the Franklin, West End, and Nashville farmer’s markets this upcoming week. 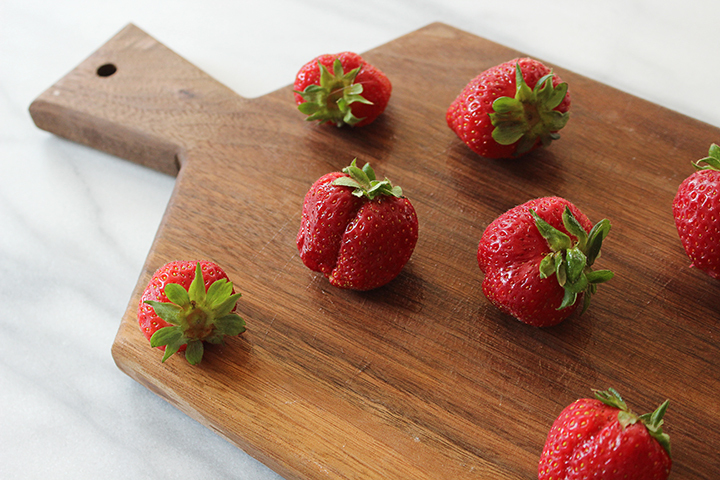 The sweetest taste and delight of eating local food in season couldn’t get better with Hank’s strawberries. Paired with fresh, local mint and savory mozzarella, this dish may seem like a strange combination, until you take the first bite! I promise. 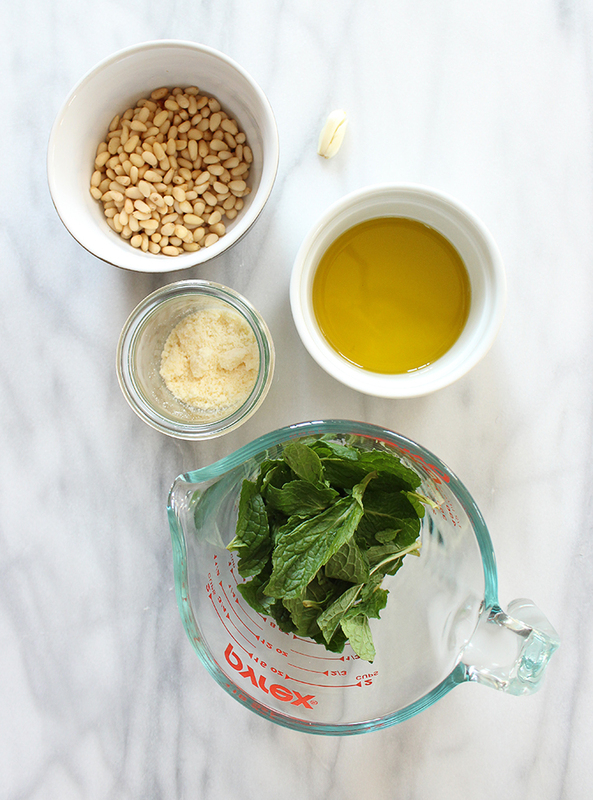 In a food processor, plush olive oil, mint leaves, pine nuts, parmesan, and garlic. (I had to use my blender, and I wouldn’t recommend that, for ease of grinding). 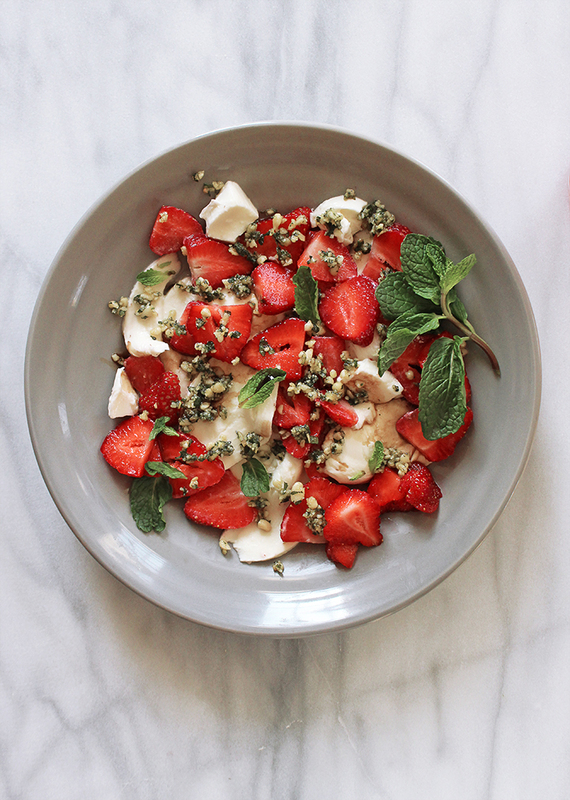 On a platter, layer the mozzarella and strawberries. 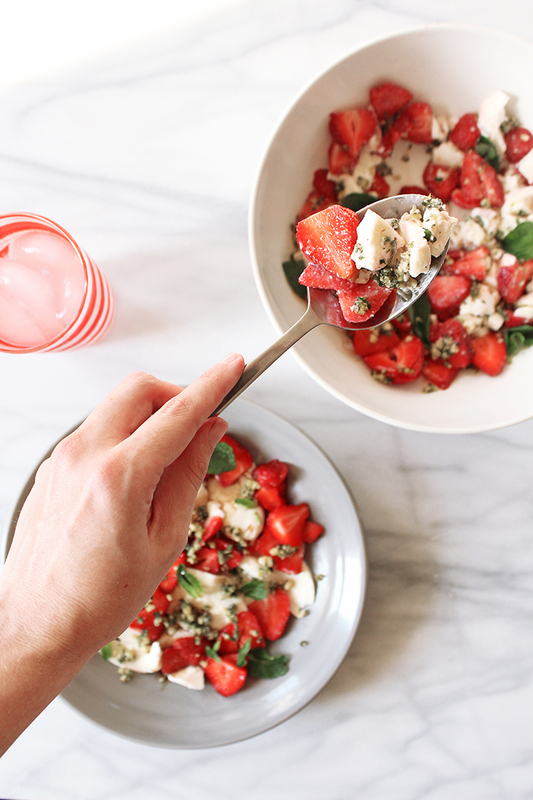 Spoon over the mint pesto. Drizzle with balsamic vinegar and garnish with more mint leaves. This is a lovely side dish or would grace a bed of lettuce and grilled chicken beautifully for a more substantial meal. This entry was posted in CSA, Recipes and tagged delvin farm recipe, local produce, mint, salad, strawberry on May 25, 2015 . I love trying new produce and watercress has been one of those leafy items I have yet to try in my own kitchen. It’s bright green color caught my eye at the Franklin Farmer’s Market last Saturday and I snatched up a bunch at the Delvin Farm’s table. After a brief consult with my trusty cookbooks, I quickly gathered that oranges and cucumbers pair well with watercress. A salad can’t have too many ingredients, so to spruce it up, I included fresh pomegranate seeds, basil leaves, and toasted pine nuts. 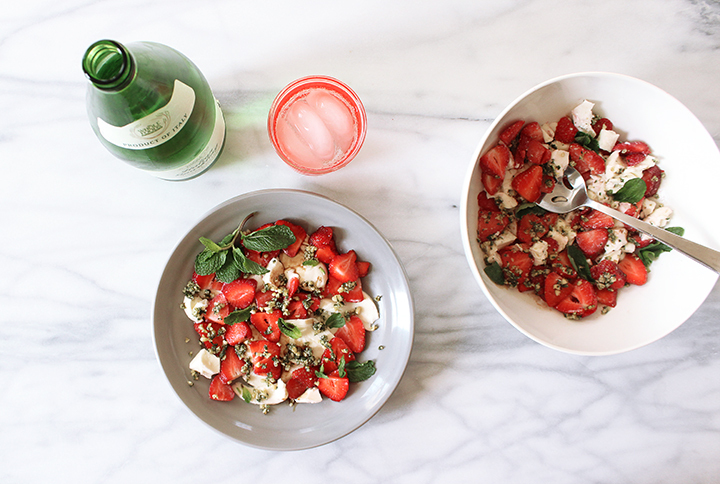 This spring salad leaves the promise of summer right on the tip of your tongue. It will work wonderfully as a first course to dinner or as a light lunch paired with some hummus & crackers. 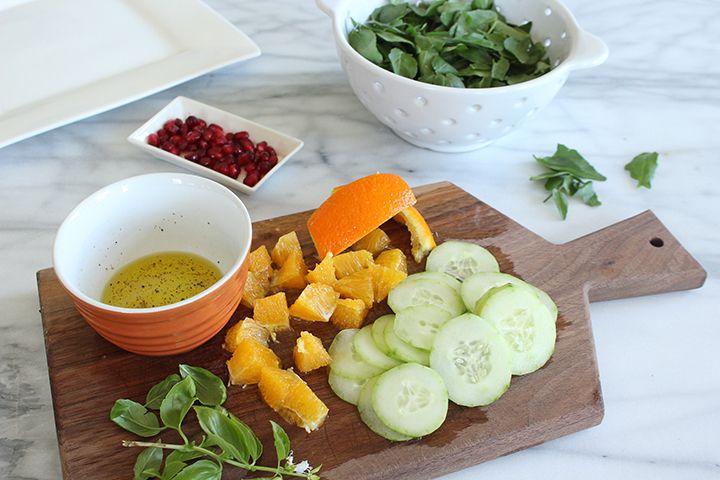 Remove the leaves from the stems of the watercress and slice the cucumber & oranges. Set aside. Heat a small skillet on low to medium heat and add a small drop of olive oil. Add the pine nuts and sauté slowly, until slightly browned. 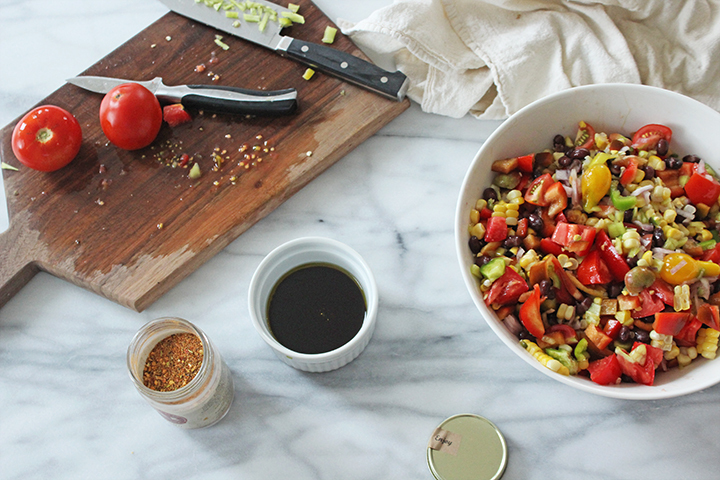 For the dressing, whisk together olive oil, champagne vinegar, and a dash of salt & pepper. 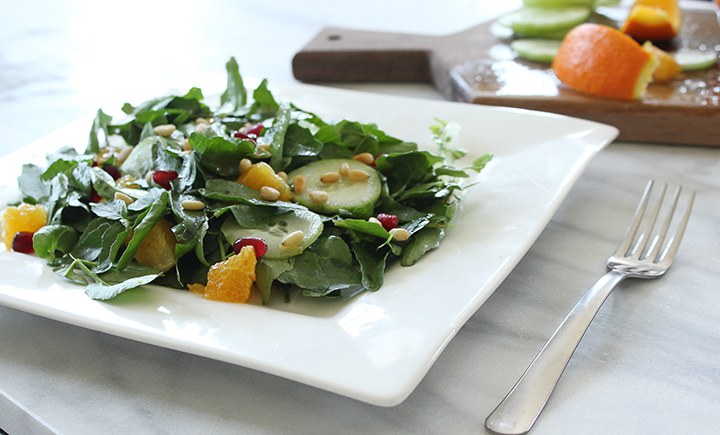 Toss the pomegranates and pine nuts into the watercress, cucumbers, and oranges. Coat generously with the dressing & enjoy! The above recipe comes to us by our guest blogger and food fan, Amanda Barnhart. Amanda can be found every Saturday at the Franklin Farmers Market foraging among all the local produce brought in by our Middle TN farmers. 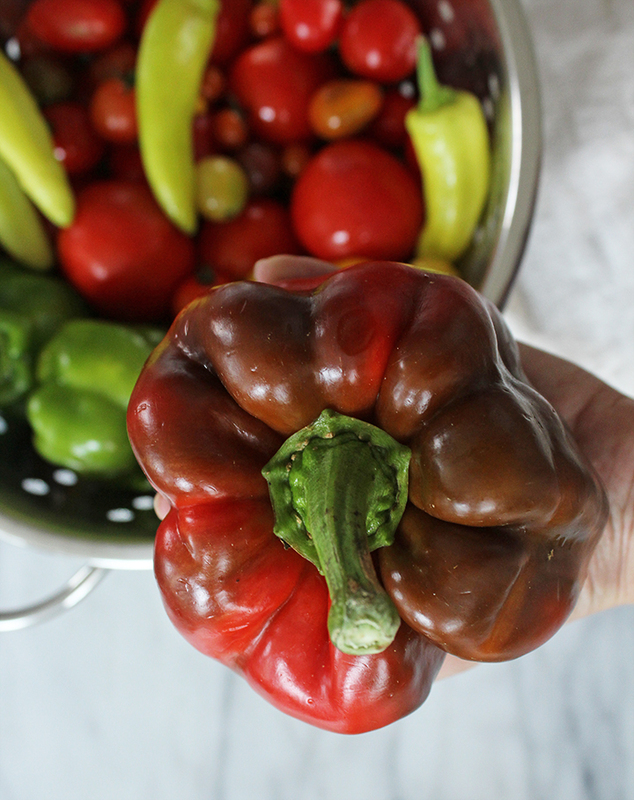 We love her photography and fresh look at food we grow on the farm. Amanda is an art director, food enthusiast, and cat lover. She curates & photographs new recipes weekly on her vegetarian food blog, PlatedColor.com. You can see more photos and read about this recipe there. This entry was posted in Recipes and tagged cucumbers, plated color, salad, watercress on May 6, 2015 .